Royal Canin Canine Gastro Intestinal Low Fat aids a healthy digestive system in dogs with digestive disorders. This complete food helps regulate lipid metabolism in dogs with hyperlipidaemia. 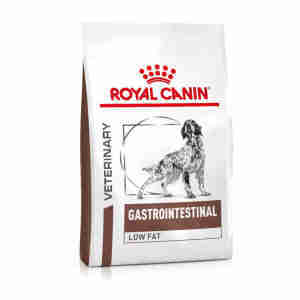 Royal Canin Canine Gastro Intestinal Low Fat is a complete food made with low levels of fat and high levels of fatty acids to help improve your dog’s digestion. It has been clinically developed with a combination of natural ingredients to prevent the irritation of upset stomachs. Developed for dogs with gastrointestinal problems like pancreatitis, hyperlipidaemia and lymphangiectasia, Canine Gastro Intestinal Low Fat is made with highly digestible proteins to ensure your dog absorbs the maximum amount of nutrients. Thanks to its low fibre content, Gastro Intestinal Low Fat helps to limit fermentation and improve stool quality. A patented complex of antioxidants helps to neutralise free radicals and support your pet’s digestive tract. low fat, making it perfect for dogs who require a low fat diet to help digestive disorders. Gastrointestinal disorders in dogs can range from stomach upset and diarrhoea to more severe illnesses such as hyperlipidaemia and pancreatitis. These disorders affect the digestive system, meaning your dog can’t efficiently digest food and absorb essential nutrients. A gastrointestinal disorder can be highly dangerous and should never be ignored. The most common symptoms of digestive disorders in dogs are loss of appetite, vomiting and diarrhoea, but can be more severe, such as seizures and abdominal swelling. If you notice any of these symptoms you should contact your vet immediately for a full diagnosis. Your pet can become dehydrated during illness; making sure they always have fresh water will combat this. Because veterinary diets are formulated for the nutritional support of pets with specific clinical conditions, we recommend that you only use them under professional advice. For more information on feeding Royal Canin Canine Gastro Intestinal Low Fat to your dog, please consult your veterinary surgeon. COMPOSITION: rice, dehydrated poultry meat, wheat, barley, hydrolysed animalproteins, beet pulp, yeasts, animal fats, minerals, fructo-oligo-saccharides,psyllium husks and seeds, fish oil, hydrolysed yeast (source ofmanno-oligo-saccharides), marigold extract (source of lutein). ADDITIVES (perkg): Nutritional additives: Vitamin A: 11700 IU, Vitamin D3: 1000 IU, E1(Iron): 43 mg, E2 (Iodine): 3.4 mg, E4 (Copper): 9 mg, E5 (Manganese): 57 mg,E6 (Zinc): 186 mg, E8 (Selenium): 0.08 mg - Preservatives - Antioxidants. ANALYTICAL CONSTITUENTS: Protein: 22% - Fat content: 7% - Crude ash: 6.6% -Crude fibres: 1.7% - Per kg: Essential fatty acids: 14 g - Omega 3 fatty acids:2.5 g.
Our 13 yr old Golden Retriever had Pancreatitis last year and has just been diagnosed with Cushings. She needs a low fat diet and this Royal Canin Low Fat has helped settle her tummy. Well recommended.